You are here: Home / Live / lds general conference “i spy” game for kids :: free printable! 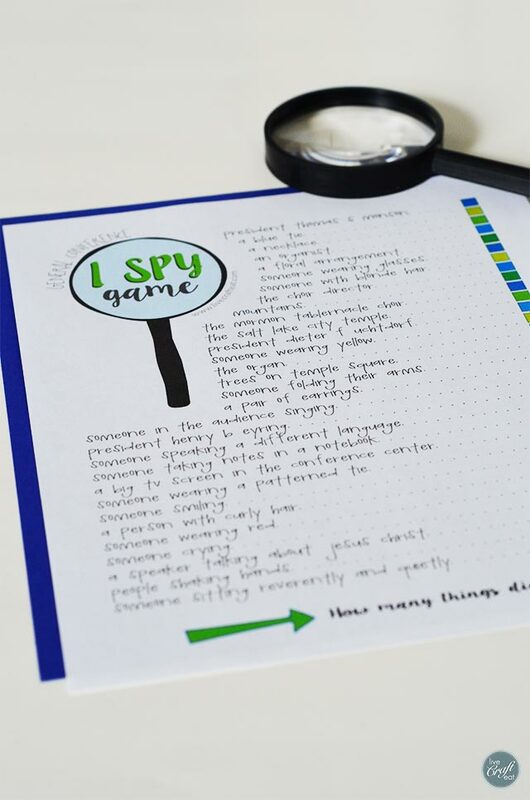 lds general conference “i spy” game for kids :: free printable! lds general conference is right around the corner, and that means it’s my favorite time of year! and since my kids are totally into playing “spy” games, whether it’s trying to sneak up on mom and dad without being seen, trying to solve random mysteries they discover, talking to each other through their walkie-talkies, or re-playing all the games we made for their spy-themed birthday parties, (can you tell they love being little spy kids!) i went ahead and made them this little spy list so they can use their binoculars or magnifying glasses to see if they can spot a number of things during general conference. they can find these things when people are speaking, the choir is singing, they show the audience, or even when they show a shot of temple square. this is just one of many general conference activities and traditions that i put together for my kids every year, along with these free printable lds word searches for kids, their diy dry-erase books, and our semi-annual mini french toast trifles with homemade syrup for breakfast sunday morning. it seriously is a highlight for them and me, and i feel like all the effort i put into activities for them not only helps them get more out of general conference, but myself as well! 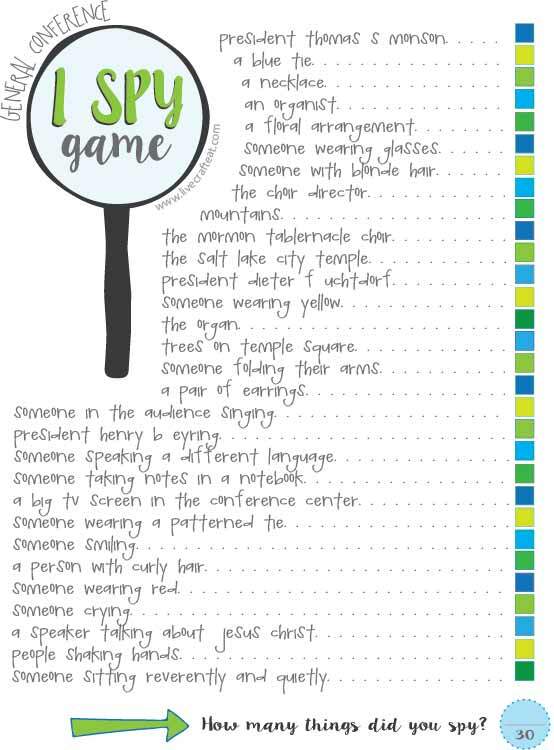 do you think your kids might like to use this “i spy” list to use during general conference? 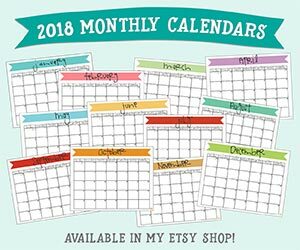 click here to get your free printable! because there’s nothing more fun than watching general conference AND being a spy kid! i just may be printing out a list for myself! if you’d like to get EVEN MORE IDEAS for general conference with kids, check out my post: the ultimate guide to general conference with kids – there’s hundreds of great ideas there! « chocolate cream cheese cake bars to die for! Thank you so much! This is DARLING! ! ! Thank you so much for all of these GREAT General Conference ideas! It is so hard to keep 4 girls, 15, 13, 11, and 9, and 2 adults engaged in what is going on. I try to come up with stuff on my own but I just get too overwhelmed. Thanks again! You’re most welcome! Enjoy conference! So cute! Thank you for updating it too! I can’t wait to have my kids try this out this year. I’m also printing a couple for the sister I minister too. Thanks again! You’re so welcome! I’m glad you like it!